For Marina Pinsky’s solo show at Gluck50, the installation in the galleries reflects the architecture and history, the moving of people and movements of art still present in the city. Drawing on her surroundings, Pinsky filters these aspects through her own perspective and research, selecting aspects to place in conversation within the exhibition. The gallery is close by Milano Centrale, and in a sense the exhibition begins there. Walking out from its facade, in the purported “Assyrian-Lombard” style, one travels along the wall of the train tracks that extend north in a thick column before fanning out in every direction like the stem of an artichoke. Echoing our passage through the station, the walls of the entrance to the gallery are painted with trains of different shapes and designs, their individual color schemes like the maritime signals of ships. The main gallery’s two sculptures take simple architectural forms that reference both the vault of Romanesque churches and the clean lines of Italian Rationalist architecture. Covered in a grid of dazzling decorative plastic plates, the sculptures seem like both stained glass windows and modernist monoliths. Unlike the structures of modernism, however, the sculptures derive less from an idealist or formal program and more from its immediate environment, namely the arched windows of the gallery itself. In an adjacent room, a third sculpture with a more Renaissance silhouette depicts the altar piece of the Maestro del Trittico di Sant’Antonio Abate hanging in Milan’s Museo Bagatti Valsecchi. The painting is covered with conservator’s tape, forming little opaque patches over the image. On the back of the sculpture, apertures are cut in the same pattern as the blocks of tape, revealing a projected video of an old window with stained glass. One can see in the close-up shot insects squirming on the cloudy glass – an infestation of flying ants striving to get out. Like the paint flaking from the Maestro’s altar piece, the ants register the pressures of time against these static surfaces. Connecting the sculptures runs a set of miniature train tracks that passes between the galleries through a narrow arched doorway like the mouth of a tunnel. Each tie between the rails is stamped with the date it was made, charting the progress of the project at Gluck50. One imagines a miniature team of rail workers slowly laying track, October 15, 16, 17, etc. 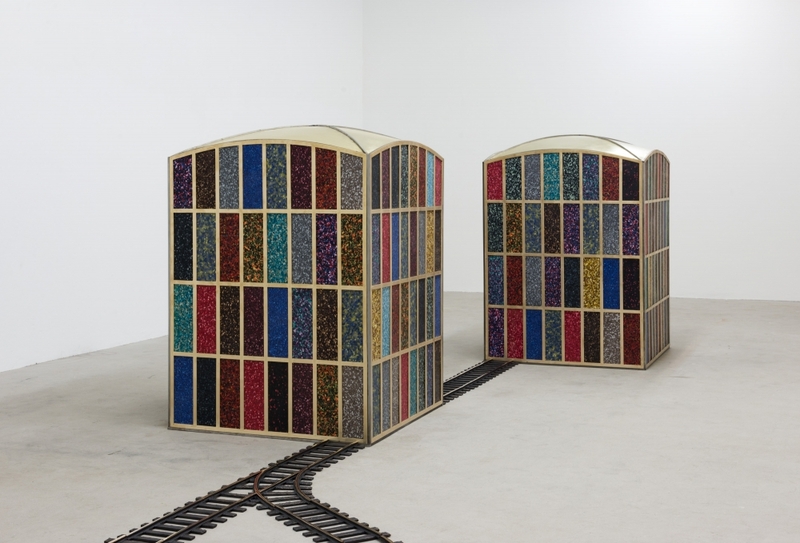 The tracks seem to connect the installation into a singular system, but one which reflects the structures and environment around it. This system contains not only the signals of trains and the schools of architecture, but also the flaking of paint, the passing of days, and the struggle of ants.